We’re putting together our menu and shopping list for our big Super Bowl party this coming weekend, but we wanted to give you a sneak preview. 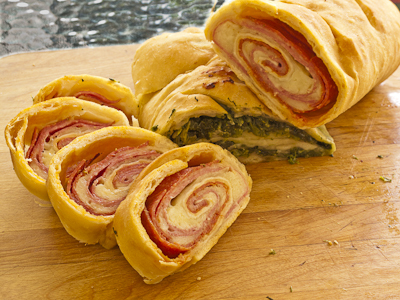 Above are two versions of Stromboli: Genoa, Pepperoni & Provolone, and Spinach & Mozarella. We cooked these for our big Inaugural Party last week, but they will undoubtedly make an encore appearance on Sunday. As we think about it, though, ‘Super Bowl Party’ may be a bit of a stretch. We don’t own a television, and neither of us are 100% certain who’s playing. But we will have some company, and we will prepare a festive meal, then perhaps walk to a nearby sports bar to watch the commercials. This entry was posted in Commentary on January 28, 2009 by Skip. Thanks very much. I’ve been instructed to recite the official party line: We’re waiting for the dough to rise. But seriously, we’ll have the recipe for Stromboli and more tomorrow or Friday.